British officials have said Mr Brady killed himself after his questioners stepped outside the room. The 40-year-old was on weekend parole from prison when he was arrested following a domestic dispute. His family have said the PSNI was responsible for his death. A Police Ombudsman’s investigation into his death is underway. 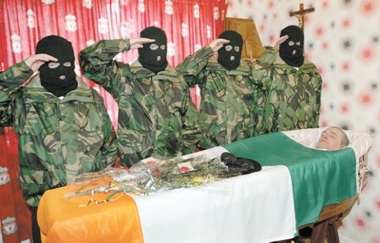 Four men dressed in military uniform and black masks today flanked the coffin at the deceased Volunteer’s home in Strabane, County Tyrone. Three men fired shots into the air over the coffin before it was moved to the church for the funeral mass. The coffin was draped in the tricolour and topped with a black beret and gloves and a guard of honour of some 50 men in white shirts and black ties and trousers lined the route from the house. Between 300 and 400 people gathered outside the house for what was a traditional republican military funeral. On the previous evening, a uniformed colour party stood guard beside the open coffin inside the house as crowds came to pay their last respects. There were relief that the PSNI did not attempt to intervene in the funeral but a PSNI helicopter hovered a short distance away. Following the funeral service at the Church of the Immaculate Conception in Strabane, Mr Brady was buried at Doneyloop cemetery in County Donegal where his father is interred. On Monday, a protest vigil was held outside Derry’s Strand Road PSNI station. It was organised by the Irish Republican Socialist Party (IRSP) and was also attended by members of the 32 County Sovereignty Movement and the Republican Network for Unity. Around 200 republicans, many holding black flags, stood in the middle of Stand Road outside the PSNI station carrying posters reading ‘Justice for John Brady.’ Relatives and friends of Mr Brady were also in attendance. At the protest, Willie Gallagher from the IRSP unequivocally said the PSNI were responsible. “The finger of blame is pointing firmly at the police,” he told the crowd. Mr Brady’s family have said they do not believe Crown force claims that he took his own life. Speaking from her Strabane home, his sister Lorna said: “John would not do that. I know in my heart of hearts that he would not have done something like that. People may say that I am in denial but if they knew John like I knew him they would know he would not have done that. We have a lot of questions and we need answers,” she said. Ms Brady said her family believe “something sinister” happened. “We don’t know a lot of the details yet but there has been a lot of inconsistencies in what we do know. The family have serious concerns,” she said. She said she had spoken to her brother before he was arrested and he was positive and making plans for the future. “I was talking to him that morning and he was definitely not in that frame of mind. He would not have done it to his mother. He would never put her through that. John would not have done this and if he did I want to know what they did to drive him to do it,” she said. She also rejected PSNI claims that her brother took his own life because he did not want to go back to prison. “It was not a case of going back to prison; John was still in prison and only released at weekends and was due to be released in five weeks,” she explained. Ms Brady also said she is “hopeful” the Police Ombudsman’s investigation into her brother’s death will bring answers. “From talking to the Police Ombudsman I believe that they are going to carry out a thorough investigation. I know it won’t bring John back to us but we need to know the truth about what happened so hopefully no other family has to go through this,” she said. “I am hopeful for the truth but I think ranks will be closed and the Police Ombudsman will find it hard to get at the truth. The police didn’t give John any peace in life and they have not given him peace in death either because they have been driving past my mother’s house,” she said. She added, “I campaigned for justice for John when he was alive and I’m willing to campaign in his death. Because until the day I die I want to find out the truth.